Insulating glass is produced from glass sheets and edge bond materials. After their assembly on industrial production lines, the insulating glass elements are supplied to window manufacturers or directly to a building site. Depending on the desired performance, the glass sheets of an insulating glass element are sputtered with different coatings. For a better thermal performance the cavities of a double or triple unit are filled with noble gas. 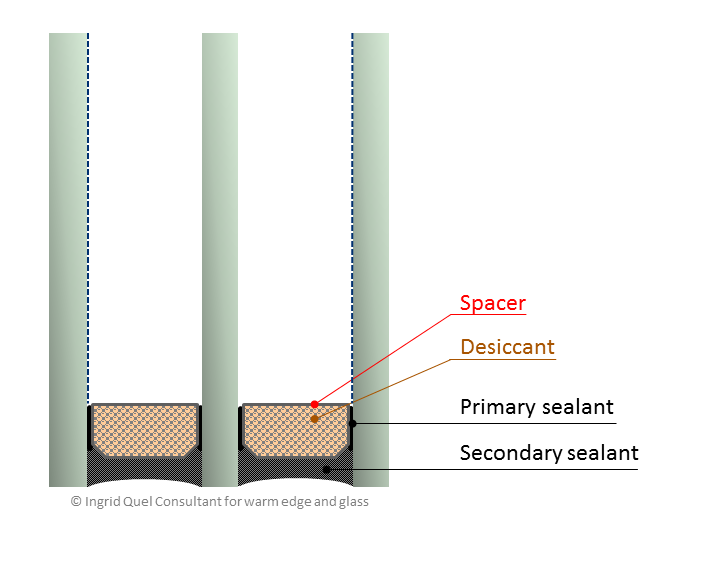 Today, the double sealed organic edge bond is presumed to be standard for insulating glass. 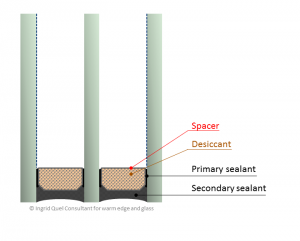 It consists of a spacer filled with desiccant, a primary seal of butyle and a secondary sealant. 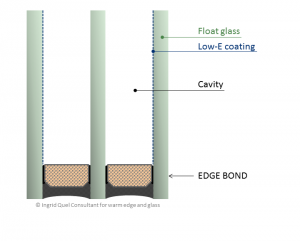 For a proper durable functioning of the insulating glass element, the insulating glass edge bond must hermetically seal the air gap. Neither humidity is allowed to intrude into nor gas to leak from the cavity. The spacer holds the space between the sheets of a double or triple glazing. Thereby, together with the thicknesses of the glass sheets, it defines the overall thickness of the insulating glass element. During the whole life time of an insulating glass element, climate loads are stressing the edge bond. The spacer has to bear up permanently against these forces. 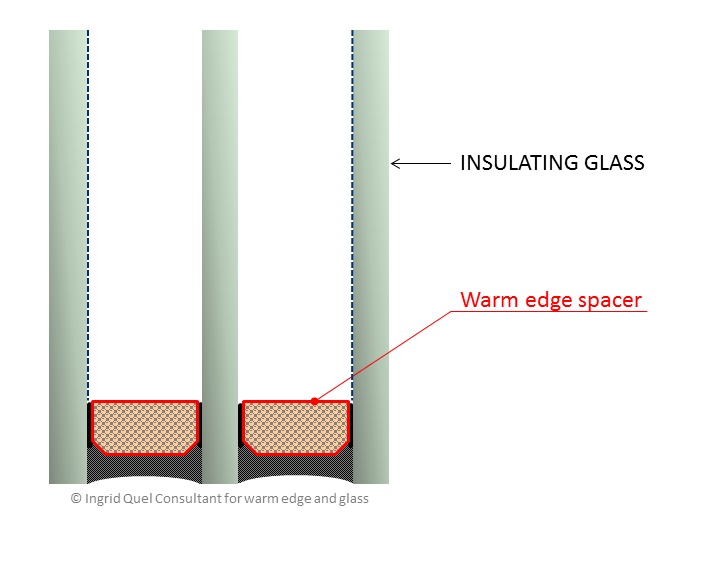 „Warm edge“ is a colloquial expression for a thermally improved edge bond of insulationg glass. Traditional spacers are made of heat conducting aluminium or steel. They are responsible for a thermal short-circuit at the edge of insulating glass. Through this linear thermal bridge, precious thermal heat is guided outdoors and, in return, the roomside glass edge cools down. This is why during the heating period in winter, condensation at the glass edge appears more likely with traditional spacers. With “warm edge”, those thermally disadvantageous spacers are replaced by products made of less heat conducting materials. “Warm edge” reduces the thermal bridge of the transition zone between glass edge and window frame or facade profile. This saves thermal heat and reduces the risk of condensation at the glass edge. 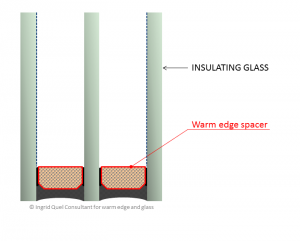 “Warm edge” improves the thermal transmission coefficients of windows (Uw) and facades (Ucw).